The first satellite it encountered, AMC 11, receives digital programming from cable-television channels, including the Food Network and MTV, and transmits it to more than one hundred cable systems across the U.S., Canada, and the Caribbean for distribution. SES, which operates AMC 11, was able to put mitigation measures in place to prevent interruption of service as Galaxy 15 drifted past the first week of June. On July 12 and 13, Galaxy 15 drifted past Galaxy 13, and again a successful mitigation plan was executed to prevent interruption of service. Galaxy 15 will continue to drift past three other satellites throughout August and possibly September. Since April 8th, many significant questions have been raised about the long-term viability of operations in the GEO region, given the current operational practices of global military, civil, and commercial operators. This article examines the Galaxy 15 event in greater detail, and offers recommendations for dealing with similar events in the future. Intelsat is creating best practices for how a spacecraft operator should behave in a responsible manner, by communicating the problem to other space actors (including competitors) and working with them to minimize the negative impacts. While there is no chance of Galaxy 15 colliding with another satellite in the near-term, it is now one of the hundreds of known pieces of space debris in the most heavily-used and economically valuable zones in Earth orbit, and will pose a long term hazard to GEO satellites located over North America. The inability to easily and accurately determine what caused Galaxy 15s malfunction is a strong incentive to improve the ability to attribute on-orbit failures, both to try and create solutions and to reduce tensions that could arise from a case of assumed hostile action. Development of on-orbit servicing (OOS) technologies and capabilities, along with improved global space situational awareness (SSA), are essential tools to help prevent situations like this in the future and minimize the negative impacts such situations have on space activities and the space environment. The dual use and security implications of OOS technologies means these technologies should be developed, and more importantly used, in an open and transparent manner to promote confidence and stability in space security. According to news reports, on April 5, Galaxy 15 stopped responding to commands from ground operators. At the time, Galaxy 15 was providing a variety of media services to North American customers, including video transmissions, and also had a payload used by the U.S. Federal Aviation Administration. Intelsat quickly decided to move one of its on-orbit spare satellites, Galaxy 12, from a holding location to take Galaxy 15s spot and customers. Since the satellite continued to provide service to customers, Intelsat originally deemed the anomaly not terribly serious. It would take a while for Galaxy 15 to drift far enough where its service was disrupted; by then Galaxy 12 would be in place and able to take over. On April 20, Orbital Sciences, the company that built Galaxy 15, suggested the communications problems with Galaxy 15 were potentially caused by a large geomagnetic storm occurring in space. In fact, on April 5, at 12:12pm MST, the NOAA Space Weather Prediction Center had released a space weather advisory warning bulletin about the storm. Galaxy 15 came out of the Earths shadow and into view of the Sun while this geomagnetic storm was occurring. 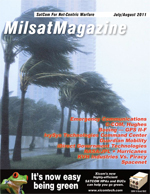 There is evidence that the storm somehow damaged the satellites ability to receive or execute commands, although this has not, and may never be, fully verified in large part because of the lack of scientific ability to correlate space weather with specific satellite malfunctions and failures. Whatever malfunction that did occur did not affect either the satellites ability to re-broadcast signals or its ability to keep its transponders pointed at the Earth and Solar panels aligned with the Sun (known as Earth lock). This allowed the spacecraft to continue to receive and transmit signals. What it did affect was the ability of Intelsats ground controllers to maneuver Galaxy 15 to maintain its orbital position. Intelsat issued between 150,000 and 200,000 commands to the satellite in an attempt to get a response to either turn off its communications payload or maneuver. When these efforts failed, the company attempted to send an even stronger signal to try and force an overload of the satellites power system and cause it to shut down. This too failed. As a result, the satellite continued to drift slowly eastward through the GEO belt. What had seemed like a small problem was about to get much bigger. On April 30, Intelsat raised the issue of possible interference with other satellites publicly for the first time. On May 4, Intelsat announced that Galaxy 15 was too close to another satellite, AMC 11, to attempt any further interventions. Galaxy 15 drifted into AMC 11s orbital slot around May 23 and exited on June 7. During this time, the possibility that it could cause interference with AMC 11s broadcasts prompted SES, the owner of AMC 11, to announce a plan for minimizing any interference caused by Galaxy 15 as it drifted past. The plan involved moving another satellite, SES-1, into the same orbital box as AMC 11. As Galaxy 15 passed through the area, traffic was switched to SES-1 and then back to AMC 11 to stay as far away from Galaxy 15 as possible. SES has posted a computer animation of this process on their website. The plan also included using a very high-power antenna owned by Intelsat to be able to better distinguish between the three satellites in the same box and transmit to the correct one with pinpoint accuracy. By all accounts, the plan worked and there was no noticeable interference or interruption of the satellite services provided by AMC 11. However, had the mitigation measures not been taken, SES said some customers would have experienced severe service degradation. Over the next few months, Galaxy 15 will continue to drift through the GEO belt and past other satellites, potentially causing more interference along the way, and at the very least, causing those satellite operators to consider their own mitigation plans. Intelsat has announced that they will continue their attempts to regain control or turn off the satellite when the satellite is safely separated from others systems. Given the immense effort Intelsat has already attempted in this regard, it is unlikely that they will succeed. Fortunately, there is a failsafe option. At some point, the momentum wheels used to maintain the satellites orientation will saturate and the satellite will lose Earth lock. Once that happens, the satellite will no longer be able to point its solar panels at the Sun, will lose electrical power, and will shut down. Even if control cannot be re-established after Earth lock loss, Galaxy 15 will no longer be able to interfere with the broadcasts of other satellites. However, one question remains, How long it will be before this happens? Intelsats current estimates suggest that the failsafe scenario will occur at some point towards the end of August or early September. Orbital has stated that the incident cost them $2.5 million as of August 1, and that they expect to spend another $1 million dealing with it over the summer of 2010. These costs are due to Orbitals investigative efforts to try and determine the root cause of the malfunction and development of fixes. Orbital has developed modifications and software patches for other satellites based on the same bus as Galaxy 15 that are currently under construction. Failed and poorly operated active satellites in GEO can create the risk of physical interference, stemming from the inability to control the satellite and command maneuvers. These maneuvers are important for two reasons: to counter the natural perturbations which cause the satellite to drift east, west, north, or south relative to its assigned slot, and to avoid a collision with another object in the GEO belt. As these numbers illustrate, there are almost twice as many dead and drifting objects in the GEO belt as there are operational payloads. And there are likely to be many more pieces of space debris that have not yet been detected  current space situational awareness (SSA) capabilities can only reliably detect objects to about the size of a basketball at GEO altitudes. Compounding the problem of space debris are satellites that are left in the GEO belt at the end of their service life. According to the recently adopted United Nations Space Debris Mitigation Guidelines, which are based on the more extensive IADC Guidelines, spacecraft operators are supposed to perform an end-of-life disposal maneuver to remove their satellite from the protected GEO region. This usually involves a series of maneuvers to boost it at least 250 kilometers (155 miles) above the active GEO belt. Figure 1 visually captures what we know about what the GEO environment looks like. Active satellites are in green and orange, while space debris is in red. Far from being the simple, organized region as it is sometimes portrayed, the GEO environment is in reality a chaotic place. Accurate station-keeping by all satellite operators is extremely important, and the in-place failure of a satellite like Galaxy 15 makes this problem worse. While it is unlikely that Galaxy 15 will collide with another object in the near future, our current inability to remove it from the active belt means that it will remain in the region indefinitely. This physical environment is only part of the picture to fully understanding the scope of the Galaxy 15 challenge. There is another side to the GEO environment that is invisible to our eyes and even optical telescopes. It is the electromagnetic (EM) environment, and it is here that Galaxy 15 poses the biggest short-term challenge. In addition to being the most physically congested region, the GEO belt is also a region in space that suffers from significant electromagnetic and more specifically radiofrequency (RF) inference. This is partly because, as discussed above, the satellites in GEO are all in relative close proximity to each other, as seen from the Earth. But more important, many of the satellites in GEO broadcast on the same radio frequencies. Most current communications satellites use what is called C-band, between 2 and 4 Ghz. Recent advances in technology and engineering have allowed satellites to be built which use high frequencies such as Ku (12.5 to 18 Ghz) and most recently Ka (27 to 40 Ghz). Commercial communications satellites are expensive investments, and therefore are usually engineered to last several years or more and tend to utilize common spacecraft buses and designs. Thus, many of the current satellites in use, including Galaxy 15, operate in the C-band. Galaxy 15s users have been shifted to other satellites, meaning that there is no longer anyone deliberately sending signals for it to re-broadcast and thus it is not actively transmitting. However, because all of its receive and transmit gear is still working, Galaxy 15 is essentially an open microphone which could accidently pickup and re-broadcast C-band signals it comes across as it drifts through the GEO belt potentially causing multi-path interference. This is the primary concern as it drifts past other active C-band satellites, such as AMC 11. First, it cannot be understated how important SSA is to preventing such events as Galaxy 15. Essentially, SSA provides critical information about what is happening in Earths orbit and the possible negative impacts certain events might have on the space environment and satellites. Although SSA is crucial, it is something that no one space actor currently does well. A satellite operator, such as Intelsat, has excellent information about the locations of their satellites, but no accurate information about the locations of other objects in orbit, including satellites operated by others and debris. The United States military operates a global network of ground and space-based radars and optical telescopes which are used to build catalogs of objects in orbit. These catalogs are the best sources of information about space debris, but generally do not have as good information about active satellites as those satellites owners do. Therefore, the key to establishing good SSA is data sharing between the states, which operate sensor networks, and thus have the best data on locations of space debris, and the satellite operators, which have the best data on the locations of their satellites. This positional data also needs to be combined with space weather forecasts, modeling, and warning. In this regard, the Iridium-Cosmos collision in February, 2009, prompted the U.S. to reinvigorate its efforts to offer SSA sharing services to nations and commercial operators through its Shared Space Situational Awareness program (formerly known as CFE). Intelsat and other members of the GEO satellite operator community have also come together to form the Space Data Association to share data among participating operators and potentially other entities. Both of these are significant developments toward solving some of the issues associated providing SSA and data sharing and should be applauded, but much more still needs to be done. Unfortunately, satellites fail in the active GEO belt regularly  on average about one per year. In February 2010, another Intelsat satellite, IS-4, also failed in the active GEO belt at its operational slot of 72 degrees East, although it was close to the end of its expected service life. On May 17, 2010, a Russian communications satellite, Express-AM1, apparently had an on-orbit failure of its attitude-control system in its operational slot at 40 degrees East over Europe. As of this writing, it is unknown if it can be moved to a disposal orbit. There can be a variety of reasons for these failures. The two most likely scenarios are a severe space weather event, for which manufacturing or operational solutions that mitigate the threat are not presently available, or an equipment failure on the satellite, perhaps the result of a problem with design or manufacturing. What is unusual in the case of Galaxy 15 is that the failure did not damage its communications payload. However, this situation could have happened to any of the satellite operators  it just happened to be Intelsat this time, and it is almost certain that similar failures will occur again with another spacecraft. Through its actions during this event, Intelsat is establishing best practices for how a satellite operator should respond when situations like this occur. Intelsat has been working feverishly not only to try and regain control or turn off the satellite, but also to notify their fellow satellite operators (and competitors) and work with them to try and find ways to mitigate the problem. Intelsats actions with regard to communication and cooperation in this situation should be considered the standard of care by all satellite operators for future situations of this nature. This is in stark contrast to what happened with another recent failure, that of DSP Flight 23 in the fall of 2008. DSP-23 was a U.S. military satellite which was placed into GEO in November 2007 as part of an existing constellation which provides global missile warning. The first reports of DSP-23s failure came not from the U.S. government but from amateur satellite observers who had noticed that it had stopped station-keeping in its assigned slot and had also stopped broadcasting as powerfully as before. DSP-23 was originally located over Europe and drifted towards the libration point at 75 degrees East over India, going right through a cluster of three operational satellites operated by Eutelsat and then a cluster of six satellites operated by SES Astra. Sadly, it was the same amateur observers who provided SES Astra with the first warning that DSP-23 would drift through their constellation, and it was only after it broke in the media that the U.S. government provided assistance to SES Astra. It is important to note that the United States is not the only key player that has acted with undue secrecy when it comes to sensitive satellites adrift in the active GEO belt. There are numerous Russian military satellites which either failed or were intentionally left in the active GEO belt, along with many Russian rocket bodies. And while the United States has made significant strides recently in providing conjunction assessment assistance for all space actors, the Russian government still does not even provide basic catalog data on debris to the public. Although SSA, communication, and cooperation are critical to responsibly dealing with a zombiesat situation, they do not solve the problem. This leads one to consider the core problems of placing objects into space, particularly in the GEO orbit: What do we do when a spacecraft breaks? Satellite engineers put a lot of time and effort into designing systems that are redundant on multiple levels and can withstand the harsh space environment. However, satellites are complex machines and do fail, and when they do so in orbit, their operator cant just pull over to the side of the road and call for a tow to the nearest repair shop. That may soon be changing. Recently, there has been renewed interest in the concept of on-orbit servicing (OOS), the ability to refuel, move, or even fix satellites in orbit. In 2007, a student group from the International Space University produced a detailed report on the topic, outlining which missions have the most viability from a technical and economic standpoint and what the challenges are to making OOS a reality. In March 2007, the Defense Advanced Research Projects Agency (DARPA) conducted an experimental mission in low Earth orbit to test some OOS technologies. Dubbed Orbital Express, it consisted of two spacecraft: the Autonomous Space Transport Robotic Operations (ASTRO) vehicle and a prototype next-generation serviceable satellite called NEXTSat. Over the course of three months, the two spacecraft conducted a series of operations, including docking and transfer of fuel and a battery change. Recently, MacDonald, Dettwiler, and Associates (MDA), a major Canadian space contractor, announced that it saw increased evidence of a business case for OOS, especially in the GEO region, and that it is currently working on further developing the Orbital Express technology for GEO applications. Development of OOS technologies could potentially allow for several beneficial capabilities. The first would be placing an on-orbit tow truck located in the GEO belt (or in low Earth orbit) which could be used to move malfunctioning satellites such as Galaxy 15 back to their assigned slots. If everything else is working except for their ability to maneuver, the tow truck or other system could attach an auxiliary maneuvering system to the satellite to repair and allow it to resume operation. An orbital tow truck could also be used to boost satellites out of the active GEO belt at the end of their service life. This tow truck function could also be expanded to include all the dead spacecraft, rocket bodies, and other large pieces of debris already littering GEO. Known as orbital debris removal (ODR), this process of actively removing objects is the only known way to clean out the legacy debris that exists in GEO and is a topic that has received a lot of attention lately. Currently, one of the biggest issues with this end-of-life-disposal process is accurately estimating the amount of fuel remaining onboard a satellite. This is very difficult to do, with potentially serious cost implications for the operator. If they err on the side of caution and dispose of the satellite early, it could mean forgoing months or years of revenue generated by the satellite. But if they wait too long, they might not have enough fuel to move the satellite out of the way. In either case, hiring an OOS satellite to perform the disposal maneuver for them could be very beneficial. At the 5th European Space Debris Conference in spring 2009, scientists and debris researchers concluded that simply reducing the amount of space debris we create is not going to solve the problem. There is enough existing debris that even with no new launches, debris-on-debris collisions will continue to create more debris. The researchers concluded that ODR is necessary to ensure the long-term sustainability of Earth orbit, and that removing a few as five or ten of the most massive debris objects each year might be enough to stabilize the growth in debris population. These conclusions prompted DARPA and NASA to jointly sponsor the first International Conference on Orbital Debris Removal, held in December 2009. There is a downside to developing these OOS capabilities  most of the technologies and capabilities that provide OOS could also be used to intentionally harm satellites and could be considered offensive counterspace capabilities. This is not a new concept  it dates back to almost the dawn of the Space Age with the original proposal by the American military for Project SAINT (short for SAtellite INTerceptor), a satellite consisting of a television camera and radar mounted in the nose of an Agena B upper stage. After being placed in orbit, SAINT would then maneuver close to an unfriendly target satellite, photograph and analyze it, and report back all the details to the U.S. military. The U.S. Air Force wanted to also give SAINT the ability to destroy or disable the target satellite, but such efforts were blocked by the Eisenhower and Kennedy administrations and the program was eventually canceled before it became reality. Recently the U.S. military has funded a series of technology demonstration missions and experiments to develop different technology concepts similar to those found on the original non-destructive SAINT program. These include the XSS-11 and inspection satellites (more information at this link: http://www.kirtland.af.mil/shared/media/document/AFD-070404-108.pdf) (located in LEO and GEO, respectively) and NASAs Demonstration for Autonomous Rendezvous Technology (DART) satellite (http://www.space.com/missionlaunches/050422_dart_update.html). Most recently, the United States launched the X-37B Orbital Test Vehicle 1 (OTV-1) on April 22, 2010 (http://secureworldfoundation.org/images/X-37BOTVFactsheet.pdf). The X-37B is a miniature version of the space Shuttle which is launched on top of a conventional space launch vehicle. All that being said, there is no evidence that the United States has developed any of these satellite programs with the goal of using them for offensive counterspace purposes. All of these programs are critical milestones in developing and advancing OOS technology. Moreover, the lessons learned from programs such as MiTEx and XSS-11 could be of great benefit in situations such as another Galaxy 15 and can enable future orbital debris removal vehicles. However, the continued military funding of these programs, coupled with the secrecy surrounding their activities in orbit and/or orbital position, serves to garner objections from military space competitors such as Russia and China and promote concerns from global peace activists. This lack of transparency may cause other states to treat these programs as if they are space weapons. This will invariably lead them to pursue policies and programs that could destabilize the space security situation, which in the long run may be detrimental to the security of U.S. space assets and long-term sustainability of Earth orbit. Thus, it is within the interest of all space actors to continue to develop OOS technologies as they can be very beneficial in the diagnosis, recovery, and disposal of failed satellites as well as the removal of existing space debris. However, it is crucial that this development take place in as open and transparent a manner as possible to provide the necessary confidence that it is being done consistent with the peaceful uses of outer space, as laid down in the Outer Space Treaty. Essential to developing OOS capabilities, and using them to reduce space debris and operational problems, is the need to foster enhanced and integrated global space situational awareness capabilities in as many states as possible, potentially through participation in regional or international data sharing activities. The ability of states to have multiple, independent, and potentially indigenous sources of information about activities in orbit would be a major step towards alleviating many of the concerns regarding developing of OOS capabilities, and to de-conflict OOS capabilities and dual use technologies in general, including the need to service a particular satellite or remove a specific piece of debris. The satellite and space technology export controls that are currently in place in many countries will make it impossible to have full participation by all states in the technology development and operational testing of OSS capabilities. However, that does not mean that certain countries should be completely excluded from them. Transparency and confidence building can still be done through briefings on planned activities, openness in regard to the orbital location of potential dual-use spacecraft, and international participation in the selection of debris objects for removal and objects to be serviced. Some of the core elements of these policy recommendations do have support within the U.S. government. At a recent conference hosted by the Center for Strategic and International Studies, the Vice Chairman of the Joint Chiefs of Staff, General James Cartwright, warned that the U.S. and other countries could no longer keep the vast numbers of orbiting satellites a secret, and that in some cases secrecy is hampering the competitiveness of the American space industry. He also called for some level of international rules and management for space traffic to increase safety and stability in space. In the end, all states need to remember that outer space is not the domain of any one individual or State, and that the actions of any one actor in space can have consequences for the orbital environment and the operations of all other space actors. There is a shared incentive to create stability and sustainability into the environment to ensure that all States can continue to have access to and use space for benefits here on Earth. G. Roberts, Re: DSP-23 in trouble?, message posted to See-Sat mailing list, 25 November 2008.